When I write about Social Security, I normally focus on two serious deficiencies. The program was never properly designed to deal with demographic change, which means there’s a gargantuan long-run budgetary shortfall of $44 trillion. The program is a very bad deal for workers (especially minorities), offering a paltry retirement benefit compared to what could be obtained with private savings. I’ve neglected to explain, though, that there’s also an economic cost. All government spending is a burden since resources get diverted from the productive sector of the economy. Moreover, the associated payroll taxes have an adverse impact on incentives for employment. Those taxes also have a negative effect on entrepreneurship, according to new research from three economists. Here are some excerpts from their study, which has been published by the National Bureau of Economic Research. We’ll start with a look at the methodology. Entrepreneurship plays a central role in modern economies. In the US, for example, new businesses account for 20% of total gross job creation. While entrepreneurs can be very successful…, entrepreneurship remains one of the most economically risky lines of activity and can result in large wealth losses. …the marginal value of resources for entrepreneurs can be substantial, given how cash-constrained they often are. Therefore, mandating social insurance, while reducing risks,could significantly affect entrepreneurial activity. …In this paper, we…exploit quasi-experimental variation in the amount of social insurance contributions and…administrative data on the full population of Finnish entrepreneurs to address this question. …We use a standard differences-in-differences strategy and exploit a reform in 2011 that changed the ownership share rule from 50% to 30% to assess how relaxing the social insurance mandate affects entrepreneurial activity. …Overall, we find that social insurance contributions are reduced by an aver-age of 19% for the treatment group, which has more discretion over insurance contributions after the reform. This reduction represents a large cash windfall, equivalent to, on average, a 5 percentage-point reduction in corporate taxes. Here are the key results, which show that payroll taxes have a decidedly negative effect on new firms. …we observe a larger than average decrease in social insurance contributions by the owners of younger firms. The cash saved from the lower contributions is channeled into their firms, as we observe an increase in both employee compensations and other input costs, and an increase in turnover after the reform. …entrepreneurs in younger firms are more liquidity-constrained and have access to better growth opportunities than more mature firms. 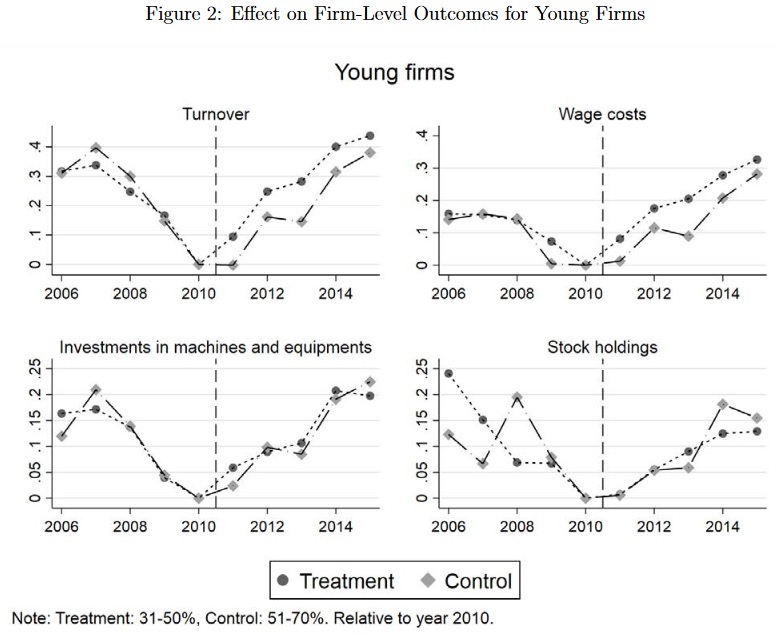 …Figure 2 shows the effect of the 2011 reform on business activity for young firms that are equal to or younger than five years old. …we estimate a 9.9% increase in turnover and a 6% increase in employee wage costs. Overall, these results imply that firms use the saved cash to pay for additional intermediate inputs and labor in order to increase turnover, and suggests that these firms might be facing liquidity constraints. Here’s the aforementioned Figure 2, showing the both sales and wages are higher when social insurance taxes are lower. The bottom line is clear. …our findings imply that the social insurance mandate…crowds out business activity for young firms… the social insurance mandate for entrepreneurs has heterogeneous efficiency costs. Efficiency gains could be achieved by…lower social insurance contributions. What is meant by efficiency gains? That’s simply economic jargon for faster growth and higher living standards. And those results occur because entrepreneurs play a key role in driving innovation. P.S. This issue is timely and important since politicians such as Bernie Sanders and Alexandria Ocasio-Cortez are pushing “Medicare for All” and other schemes that would require huge increases in payroll taxes. P.P.S. Other Democrats, such as Barack Obama and Hillary Clinton, have urged higher payroll taxes that would deliberately target entrepreneurs, investors and business owners. P.P.P.S. You can enjoy some Social Security cartoons here, here, and here. And we also have a Social Security joke if you appreciate grim humor.